Looking to open a business checking account? Get financial products and services that let you bank when and how you want. 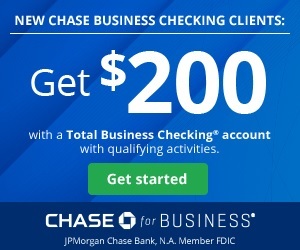 Chase is currently offering you a chance to earn a $200 bonus when you open a new Business Checking Account and meet certain requirements. Just simply submit your email to receive the coupon offer! Below is all the information and details you need to earn your bonus from the Chase Total Business Checking® Promotion! Editor’s Note: If you’re interested in what more Chase has to offer, see our list of Chase Coupons! Monthly Service Fee: Yes, see how to avoid monthly fees below. Early Termination Fees: If the checking account is closed within six months after opening, bonus amount for that account will be deducted at closing. Promo Code(s): Must enter email on online promo page to receive coupon offer to bring in-branch. Chase Total Business Checking®: If you are eligible for this bonus offer, visit the link provided in the table above and submit your email to receive the coupon offer. Then visit your nearest branch to open a new business checking account and meet certain requirements. If you are interested in more Chase Bank Offers, see our compiled list of Chase Bank Deals or the Best Chase Credit Card Promotions. A great way to stay on top of your account’s activity and enhance security. Access over 16,000 Chase ATMs and nearly 5,000 branches nationwide. Let your employees make business purchases and you stay in control. Enter your e-mail and Chase will e-mail you a bonus coupon offer. Maintain at least $1,000 balance for 60 days from the date of deposit. The new money cannot be funds held by Chase or its affiliates. This Chase Total Business Checking® offer is pretty great to obtain especially since it only incurs a soft pull and EASY requirements. Definitely give this bonus and account a shot if you’re browsing around for a great business checking account! There’s a reason why Chase is at the top! Let us know in the comment section below on your thoughts and experience with this bonus offer! Be sure to check back on BankDealGuy for more Business Bank deals!